Concept sketch of Insta-bility by Minh DuPha. Insta•bility’s concept centers on exploring societal identity, interaction, and environment as they are informed and shaped by materials. This large-scale work utilizes plastic grocery bags, which at times can be found in the branches of trees, which can occasionally line Oppenstein Park, and are typically located in heavily urban environments. They are the scattered debris and remnants of people as they go about their daily lives; witnessed swaying by wind in trees, giving an appearance of caught clouds, or pieces of sails from the river afar. They shouldn’t be there yet they are in a park created to provide an opportunity to connect us with ourselves, each other, and the earth’s natural environment while in the hub of a busy city. Plastic bags are made from petroleum oil. In 2010, the latest year for which data is available, according to the US government Energy Information Administration, at least a million barrels of petroleum went into fueling the manufacturing of our plastic products. Our relationship with plastic and oil can be compared to our relationships with other materials ability to shape our society – from the Stone to Bronze to Iron Age. Our societal reliance upon this dwindling resource suggests that our practice of civilization, due to our material consumption, may lead to our dissolution, our decivilization. This installation explored the relationship of this aesthetic, intentional, and unintentional relationship. Using over 500 plastic bags, in a process developed by the artist, to create strong, yet malleable material attached by strings, and linked to trees that act as support structures to create a temporary plane-based ceiling on top of which are additional wind-directed bag remnants, thereby creating a unique overhanging entrance to Oppenstein. This amorphous large-scale work provided people that enter the park, an opportunity to re-experience an intimate awareness of environment through the sound and movement of the materials, as they are manipulated by the weather and wind, and intimate awareness is further sustained by the site of Oppenstein. It also re-imagined the creative capabilities of the plastic detritus that has come to be such a key aspect of our lives, and our ability to re-envision and find meaning through such re-imagining. What did their presence reveal to us about our relationship with each other and with materiality itself? Minh Du Pha was born in Tra Vinh, Vietnam, and his family migrated to the United States when he was 8 years old. Minh’s experiences as a child in Vietnam deeply influence his creative approach to the practicality of art making and learning through play. His projects are rooted in his desire to rekindle the outdoor classroom inspired by third world Vietnam, which encourages resourcefulness and understanding of natural and readily available materials such as sticks, mud, grasses, and recyclables. Educated in America, Minh is a graduate of the Milwaukee Institute of Art and Design, majoring in painting and minoring in architecture. Aspiring to be an art educator, Minh has taught at the Milwaukee Art Museum, the Walker Point Center for the Arts, and Mattie Rhodes Art Center in Kansas City, Missouri. He also has NPASS certification (National Partnership in After School Science) through Mattie Rhodes. 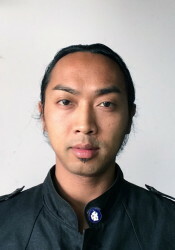 A multi-disciplinary artist, Minh du Pha, incorporates social and cultural discourse into his painting, printmaking, sculpture, and installation. Using his work for advocacy and awareness, Minh’s practice can be found in conjunction with multiple local activist groups, artists, and scientists, all striving to bring to light injustice and restore of dignity to our world.